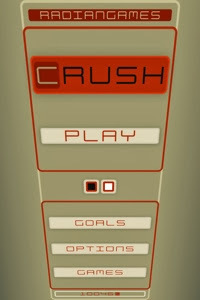 Crush is an arcade game from Radian Games. I have played most of his games, either on the Xbox or on iOS. But after falling in love with Super Crossfire HD (which I consider the best work) I was hooked and ready to try anything bearing the Radian Games titlescreen. 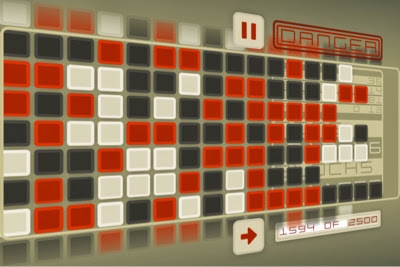 Colours are a big deal in games by Radian Games, usually they are neon and flashy and I love them. 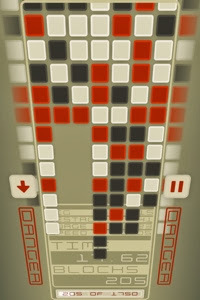 This time they are more mature - a tan-bronze background and three colours of blocks; off-white, red-orange and grey. There's also a crazy tilt to the whole thing while playing (which you can adjust if you don't like it) and one other colour scheme to choose from. This game has unlockable powers and like Ballistic and Super Crossfire, its important to choose the powers that fit to your playing style. 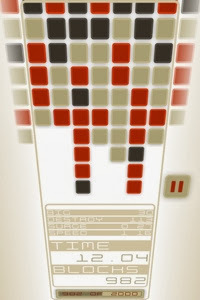 I gave this game far more chances that I usually would because of my love for Radian Games but I just couldn't find a way into this game. Sometimes I felt like I understood what to do, other times I felt like the game was too random and I was just tapping around. I would recommend this game to anyone who passively plays arcade games on their phones - people who maybe like bejeweled and things like that. It's better than those games, but just didn't hook me.